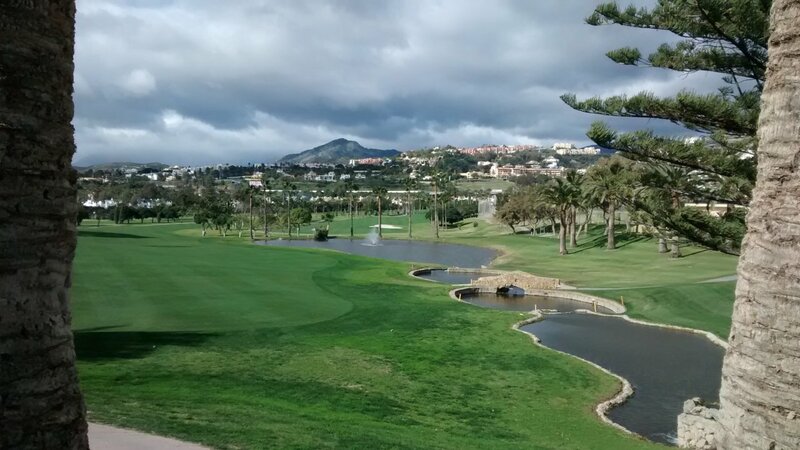 A popular mid-priced club in Neuva Andalucia, which is a large planned community with several courses (La Quinta, Los Naranjos, Las Brisas, Aloha) fairly close together. This area is just West of – and close to – Marbella and inland from Peurto Banus. So the whole area is quite upmarket with facilities and prices to match. The membership of the club is mostly Scandinavian, in particular Swedish. 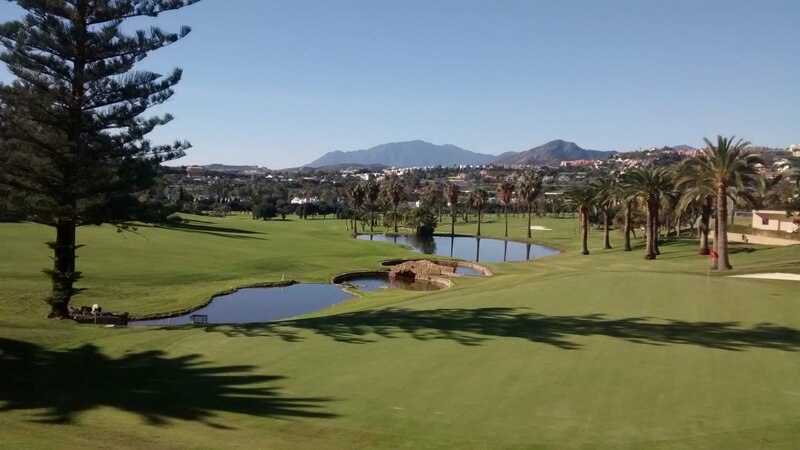 Los Naranjos is not a difficult course and suitable for all handicap levels. But still tough enough for high-handicap players to lose a few golf balls, most likely on holes with water – quite a few holes have small lakes or canalised streams. The whole course is gently rolling landscape, but no really serious elevations. Everything is well mowed, so not a lot of natural rough. Green surrounds are well maintained, so pitching is not too difficult. Large mature trees line fairways. So it looks like a parkland course, albeit more up-and-down. Fairways are reasonable, tee boxes good. Bunkers have quite large-grained, stony sand so not as high quality as the rest of the course, although still perfectly playable. There are heavy-duty bronze hole maps on every tee box. The buggies also have accurate GPS-based visual displays of the hole you are on (common in America for example, but rare on the Costa in my experience). 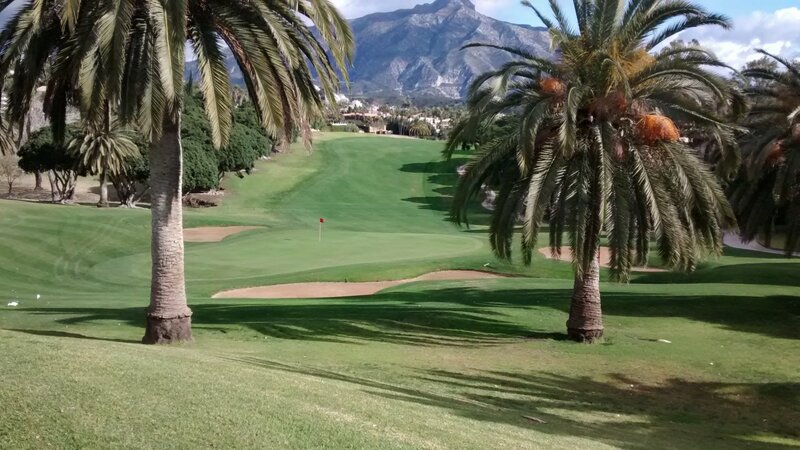 As a mid-handicap player, I think Los Naranjos is an easy course – until I approach the greens when suddenly I have to think a lot harder. By that I mean fairways are wide enough and good enough to present no major problem. For me, most fairway hazards are not really in play – unless I hit what I think is a really bad shot. The best line you want to take down each fairway is obvious from the tee box, and on all but 2 or 3 holes the green you are heading towards is visible from the tee box. On some holes you might do a gentle zig-zag along the fairway, on others you have to keep plugging away along the left or right hand side of the fairway all the way up to the green. All this is pretty obvious from each tee box. So navigating each hole up to the green for a mid-handicap player like me is interesting, but not particularly challenging. It is even easier for a low-handicap player, and quite forgiving for a high-handicap player unless perhaps they get a bad roll of the ball just off a fairway into a hazard (most likely a water hazard). However approach shots to the greens themselves are quite a bit tougher than the preceding shots along the fairway. This is because the greens are well designed to trap approach shots that are not good enough. There are a lot of bunkers surrounding greens – in several places (front / back / side). So for example there are bunkers immediately behind greens out there specifically to catch your ball on holes where they think you are more likely to hit an approach shot that is a bit too long. About half the greens are elevated, and some bunkers are also deliberately set down a bit. So you can end up having to play quite a high shot out of a green-side bunker to get back to the pin. Los Naranjos is not a course where you are going to able to putt out of many bunkers – if you prefer to do that whenever you can. Greens are large, medium-fast and reasonably undulating. A fair number of greens offer two options 1) the tiger line direct at the pin carefully guarded by green-side bunkers, 2) an easier line to an area of the green where you then have to putt 5 or more meters back at the pin. If you are a high-handicap player or just playing the course cautiously, my advice is always the same on holes where you see those two approach shot options in front of you: respect the options the course is giving you, do not take the tiger line approach to the pin, simply hope that your putting is up to the job coming back to the actual pin position. For good golfers this is less of an issue, simply because their approach shots are a great deal more accurate (good players always have much better short games than other players). This is good design for a tolerant golf course. Relatively easy play up towards the green, but shots required on and around the greens that raises the standard of the whole course from "quite easy" to "fairly challenging". Players at all handicap levels can get something interesting out there. I think the staff out on this course professional, friendly and patient - notably so seeing they probably get quite a lot of guest players on what is a busy course. The clubhouse is quite large, very comfortable, nicely decorated. The views over the course from the clubhouse terrace are very attractive. I think the food served in the terrace not very good, and service on the terrace can be slow. Perhaps a small number of serving staff (not enough of them if the clubhouse is moderately busy) or they are simply not attentive enough. I do like Los Naranjos and happily go back there any time. It is not cheap – probably top-end of mid-priced courses – but absolutely worth it in my view. If you play the course carefully (particularly your approach shots) it is not difficult to play to your handicap. There is enough variety on each hole to make the course interesting, but not a really tough challenge. A good, well-designed course in what is a fairly big and busy business operation. I particularly think the location of the bunkers on this course is very smart. One final word about Los Naranjos: I think the hole ratings here (the stroke index) for some holes a bit weird e.g. holes with a high rating I think notably tougher than other holes with a low index. Of course these index ratings are carefully calculated on each golf course and are dependent upon the tee you are playing off. Even so, some at Los Naranjos seem strange to me. My advice if you have not played the course a lot of times: respect the stroke index you see on the scorecard as a reasonable guide, but primarily play each hole difficult/easy as you see it. Review last updated: June 2015. Number of times played: 8. Los Naranjos is represented by the yellow dot. This shows that the course is 'top 5' on length compared to all other courses on the Costa del Sol, but is only 'top 10' when it comes to difficulty. An 18-handicap player can expect to go around Los Naranjos at 21 over par.